This is a favourite in Trinidad, where street vendors compete fiercely to make the best. Doubles are cheap to make and very, very good. Classic Trini Doubles consists of curried channa (chick peas) between two Baras (a type of bread), garnished with mango chutney, tamarind chutney and hot pepper sauce. In a large bowl combine flour, salt, saffron and cumin (jeera). Put aside. In another bowl place warm water, sugar and yeast. Let sit for about 5 min. until the yeast and sugar are dissolved. Add the yeast mixture to the flour mixture with enough water to make slightly firm dough. Mix well. Cover and let rise for about 1-½ hours. Punch the dough down and let it sit for another 10 – 15 min. To shape Bara, take about 1 tbsp of dough, pat with both hands to flatten to a 5”circle. If dough sticks to hand moisten palms with some water. Fry in hot oil, turning once until cooked. Remove and drain on a paper towel. 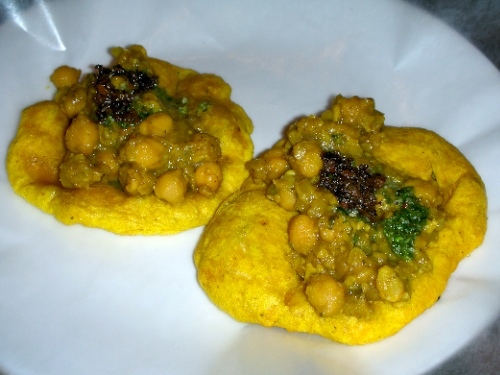 Boil soaked channa (chick peas) with salt and ½ tbsp curry powder until channa is tender. Drain. Mix 1 tbsp curry powder with ¼ cup water. Heat oil in a large skillet and add the garlic, onion, and curry powder mixture. Sauté for a few min. Add the channa. Stir to coat well with the curry mixture and cook for about 5 min. Add 1-cup water, jeera (cumin), salt, and pepper. Cover, lower heat and let simmer until the peas are very soft. Add more water if you need. Channa should be soft and moist. Add more salt if needed. Put about 2 tbsp. cooked curry channa on a Bara. Cover with another Bara. You can also add mango chutney, tamarind chutney or pepper sauce before putting the second Bara on top.